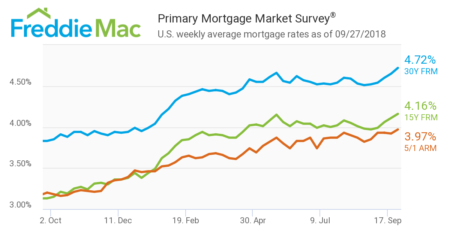 Mortgage rates have continued their upward march to the highest level since April 2011, according to the latest Primary Mortgage Market Survey from Freddie Mac. The rate for a 30-year fixed-rate mortgage averaged 4.72 percent for the week of September 27 — only 0.6 percentage points from the recent 4.72 percent high seen on April 28, 2011. Last week, the rate was at 4.65 percent. Last year at this time, it averaged only 3.83 percent. The 15-year fixed-rate mortgage averaged 4.16 percent, up from 4.11 percent last week and 3.13 percent last year. A five-year treasury-indexed hybrid adjustable mortgage is at 3.97 percent, compared to 3.92 percent last week and 3.20 percent last year. Freddie Mac Chief Economist Sam Khater says consumer confidence is at an all-time high, thanks to a strong economy and healthy jobs growth. Those factors, he says, has caused the Fed to hike short-term rates by another 0.25 percent, which results in higher mortgage rates for borrowers. Despite increased borrowing costs, Khater says buyer demand is expected to remain strong. Realtor.com chief economist says she expects rising mortgage rates to deliver a one-two punch to home sales, which have been sluggish this year. “In August, the median home listing price rose 7 percent, down from 10 percent a year ago. Existing home sales have not had a year-over-year gain since February 2018,” Hale added.